Technological advances in fabrication methods, adhesives and protective coatings have made wood the superior choice for modern sustainable bicycle design. Meticulous selection of the best available hardwoods create beautiful frames that are likely to outlast other current materials. Aside from its structural integrity, wood is a renewable and locally available material, the beauty and craftsmanship found in a SplinterBikeHaibrid frame appeals to the desire for an environmentally friendly and low carbon alternative. The 200 hour build process starts with the selection of the highest quality timber. Each piece is machined to initial dimensions, scrutinised for flaws and the moisture content measured. Time is spent matching these pieces to component requirements. Hand built SplinterBikeHaibrid frames and wheel rims are created by initially steam bending selected veneers of American Black Walnut and European Birch to form each component of the frame. High specification hybrid adhesives, (suitable for full water immersion, even in sea water) are then applied to permanently fix the shape of the frame during the second lamination pressing. The CNC router then shapes the frame and rim sections to enable perfect connection of the components to each other. Metal inserts are added such as the bottom bracket shell, seat post tube and the head tube to allow the pedals, saddle and headset to be attached in the traditional manner. For exterior protection, the frames go through a drying process and several coatings of polyurethane are applied to seal the wood and protect it from the oxidising effects of air, external moisture, organisms and UV light. 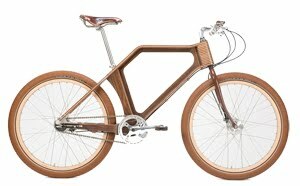 In addition to being very tough, wood has a unique ability to absorb vibrations which is not seen in other bicycle building materials. When a vibration travels along the frame, it will be dampened significantly by the cellulose in the wood before it reaches the rider. This dampening quality makes the ride noticeably smoother. Wood has a very long fatigue life when exposed to cyclical loading. When a material regularly experiences a deforming force it becomes weaker over time and is less likely to endure the same force without breaking. Wood decreases much more slowly over time when compared to metals and carbon fibre. Wooden frames offer qualities of stiffness and vibration dampening that other materials simply don't. Wood is a naturally stiff and sturdy material, due to the way it grows over time to resist forces from all directions.